← Large Format Printing Facility Done Right! When it comes to making a temporary display, there’s nothing easier than a string of banner stands! In this case, our customer wanted a display that he could take to a trade show, and then put in the real estate office afterwards. We made a 12 foot long display by putting four banner stands side by side. This gives them the ability to move things around too. As you can see, the panel on the left is designed to stand by itself or with the other three. As you can see, the graphics were designed to work this way. You really don’t want type going between the panels, since there is a 1/4″ gap between them. You can do it with things like the header, but don’t be breaking words, or worse, letters. If you design it right, the gaps between the banner stand panels become unnoticeable. One of the best things about banner stands is that they are completely self contained, so when you change your mind about where they need to go, you simply move them. That doesn’t look as good as you thought it would? Move them back. It takes a minute. 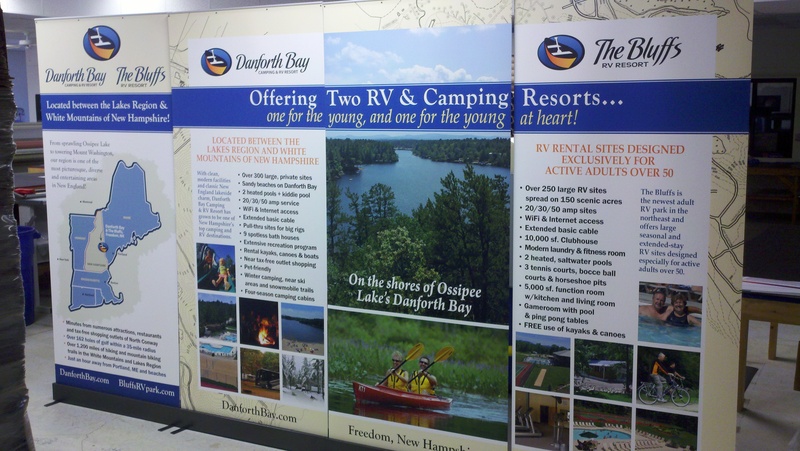 This customer used our premium banner stand, which has easily replaceable graphics. The next time they go to a trade show, they can bring a totally new set of graphics with a minimum of fuss. This entry was posted in Banner Stands and tagged retractable banner stands, roll up banners, trade show displays, trade show graphics. Bookmark the permalink.